Heart of Hope - Now is the Time to do Something! As the days pass and I watch all that is going on in the world today, I find myself struggling to live in this world yet not of it. Never have I felt so much like I don’t belong here and the straw that broke me and caused me to weep with such sorrow were the days some states announced the decision to allow the murder of not just the pre-born but the born, under the guise of “women’s health” and our “ right to choose” ! I don’t know about you but as an ambassador of Christ, many times I struggle with what to do and say, keeping silent and just shaking my head—not wanting my anger to cast a shadow on the grace of the Creator. Clearly, we are living in a time where more than ever, we can see the line drawn between the enemy and the people of God. The spiritual warfare that is being fought all around us is undeniable and even though we know God wins, we are still supposed to fight for what is right. The question is — What does that look like? Every day we must put on the Armor of God! Girding yourself for battle with anything less will be useless. If this were not a battle we wouldn’t need armor and we must purpose in our hearts to put on what He has provided—The helmet of salvation, the breastplate of righteousness, the belt of truth, the shoes of peace, the shield of faith and the sword of righteousness! We all have days where we “grow weary of doing good” and we lay around in our “holy underwear” waiting for someone else to do what God has called all of us to. Live out the fruit of the spirit! Show the world what genuine love, joy peace, patience, kindness, goodness, faithfulness, gentleness and self-control look like. Choose not to be offended but assertive in portraying these qualities to a world where the enemy has redefined and perverted them with lies. Love has become lust. Joy has become believing you ‘deserve to be happy’. Peace, patience and kindness are only for those who believe like you do. Goodness comes from comparing yourself to others rather than the Holiness of God. Faithfulness can be bought; Gentleness has fallen by the wayside with the ‘hey look at me’ mentality aided by social media and Self control is seen as a weakness rather than a strength. Pray! We are instructed to love our neighbors and to pray for our enemies. This is not easy and I admit some of the prayers I’d like to pray over them need work and help from the Holy Spirit! Pray for boldness to share the Truth in love. If you have a story of an unplanned pregnancy, adoption or the aftermath of an abortion, be bold enough to tell it! If the enemy has you in a place of shame and silence it is time to stand up. Our stories are tools we can use to tell of God’s provision, love, grace and most of all forgiveness. The Holy Spirit can and will take your words and change hearts! Practically speaking, now is the time to do something! It is true that actions speak louder than words. If you have been sitting on the side lines, get up and go! Visit ministries that are serving the Pro-life cause. Take someone with you who says they are pro-choice and let them see and hear for themselves what we do. As a former volunteer at the Pregnancy Resource Center and co-founder of Heart Of Hope, I can tell you volunteers are the backbone of success! These ministries depend on donations of time and money. No amount of time is too small, nor is any amount of money. If you have been sitting on the fence it is time to leap off! I could list many things you can do but I urge you to call, visit, and see for yourself because that will ignite the flame that will move you to action. From experience, I tell you, God is the best boss, you don’t have to pay taxes on the benefits you earn working for Him and when you give financially the interest on your money will be compounded in heaven through the lives that have been saved by your generosity. We are the only voice the pre-born have, now is the time to act on their behalf and speak up for them! 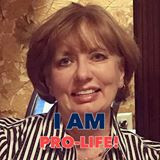 **Carolyn now lives in Reno, Nevada with her hubby, Scott and whole lot closer to her grandbabies!